It's also on sale. Boo! 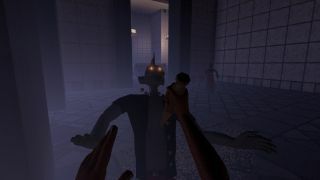 Fraser Brown's major problem with Slayer Shock—a Buffy-style game about hunting vampires—was that it was "slight and repetitive", so this new Halloween update will hopefully ameliorate that. It adds "new mission types, 100% more story events, a major overhaul of the difficulty curve" and more, so you won't be short of things to slay...while sitting indoors with the lights off, this Halloween, hoping the trick-or-treaters don't notice you're home. Minor Key's SpooOOooOOoky update is available from Steam, from Humble and from itch.io, where coincidentally (not coincidentally) the game is currently on sale for 30% off. Here are the full patch notes. Added new plot points, Big Bad gimmicks, and NPC dialogue, written by Xalavier Nelson Jr. (@WritNelson). Added Trick or Treat mission type. Added new level modules for Logan's Woods, Greyside, and The Howl. Logan's Woods levels no longer always terminate inside a cave. Adjusted challenge scalar coefficients to produce a more ideal difficulty curve. In Hard and Expert modes, local threat level is no longer reduced by succeeding a mission. Big Bads can now teleport during combat. Big Bads now use more accurate projectile aiming method. Katana animation speed is slightly reduced. Katana damage output is slightly reduced. Silver katana stun time is slightly reduced. Fanged katana debuff effect is slightly reduced. Added foreground hand motion when leaning. Added grass cards to Greyside and Lancaster State levels. Added experimental support for mouse buttons 4 and 5 (also called X1 and X2). Fixed an animation bug due to float/double precision errors. Fixed a rare crash caused by endless portal recursion.